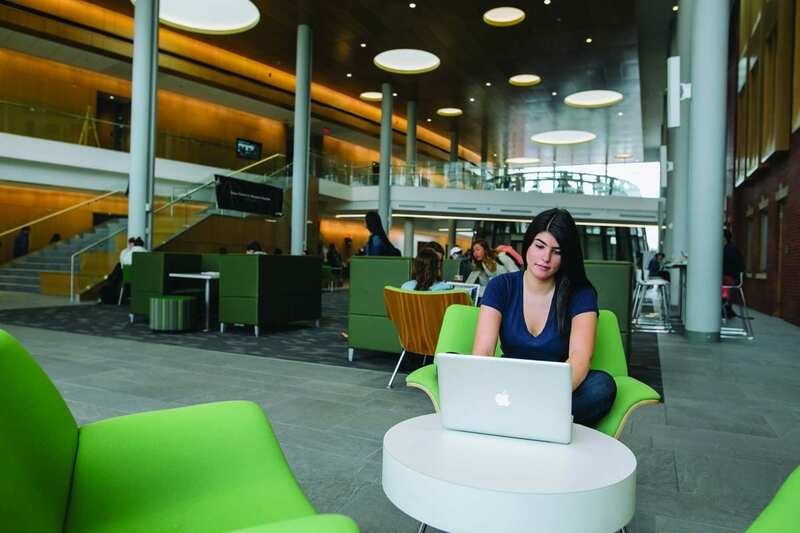 Caroline Haddad ’17 in the Arthur F. and Patricia Ryan Center for Business Studies. Greg Christenson ’89 and Eileen (Harkins) Christenson ’90 have provided ongoing support to their alma mater and its School of Business, fortifying an institution where faculty, students, and alumni are invested in each other’s success and development. Grateful for the opportunities that allowed them both to thrive at Providence College and appreciative of those who made it possible, Greg and Eileen established the Christenson (Greg’s parents), Harkins (Eileen’s parents), and Healy (Greg’s uncle, Tom Healy ’68) Family Endowed Scholarship Fund in 2016. That endowment commitment followed sponsorship of a Torch Scholarship, a four-year, termed scholarship that provided Greg and Eileen with the satisfaction of enabling a student to have the same experience that had meant so much to them. A self-described “diamond in the rough” who gives accountancy professor Carol Hartley — among others — credit for his PC and career success, Greg says that he and Eileen are committed to making sure that the fund supports current business students who will benefit from the help of others, while showing a propensity for hard work and a focus on high aspirations.